Is it OK to wear Disney shirts to Universal or vice versa? In a time when America seems increasingly divided into opposing camps and cliques, we at Attractions Magazine decided take a lighthearted poll of our readers on one of the more contentious contemporary debates: proper theme park attire! With Orlando’s attractions dominated by both Walt Disney World and Universal Orlando, many tourists (and local annual passholders) frequently bounce back and forth between the two resorts. But is it OK to do that without changing the shirt on your back? 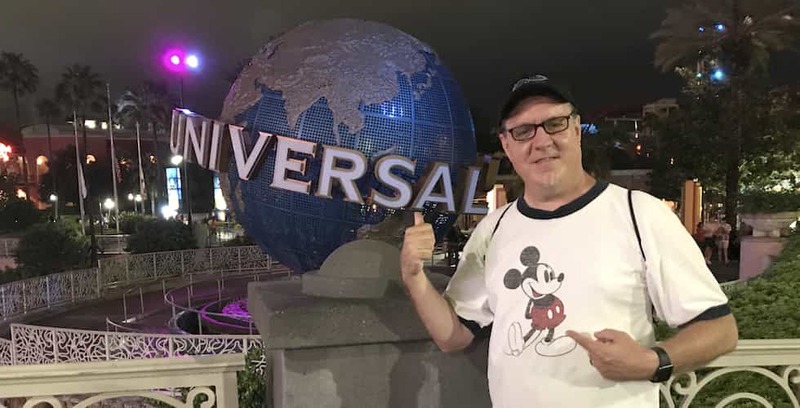 We posed the following question on Twitter and Facebook: “Is it OK to wear a Disney shirt to Universal and vice-versa?” Whichever side of the discussion you come down on, you may be surprised by some of the comments pro and con. While the final results weren’t as close as the past Presidential election (and no Electoral College was involved) there was a clear-cut winner. 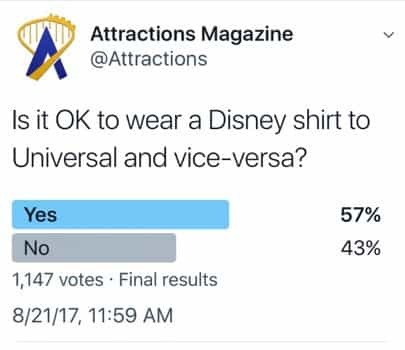 57% of respondents on Twitter, and 478 out of 716 commenters on Facebook said they think it’s fine to wear Disney-branded clothes to a Universal park, or the other way around. • I’ve seen many a Harry Potter shirt at Disney. So, it’s really up to you. • People wear Magic Bands to Universal. When it’s cold out, people wear Harry Potter scarfs to Disney. People wear Mouse ears to Universal. People wear Thing 1 Thing 2 shirts to Disney. • Yes. People do it all the time. • Yes!! My young son wore a Jaws tshirt to Disney and a cast member politely said ‘remember fish are friends not food!’ – brilliant interaction. • Since a lot of UO team members are Disney pass holders and vice versa… As a UO Team Member I don’t care if you wear Disney stuff to my park. I might have a bit of teasing fun with you but it’s all good. • Lots of people wore Disney shirts to Universal while I worked there. We kidded them a little, but everyone on on both sides always had a fun day. • I love it at the bag search, both at universal and Disney when they joke about their rivals bags your carrying! All in good humour. • Yep. It’s only going to help tourism as a whole. People should go to both! • Unless the shirt says something like “I am currently standing in Disneyland right now!” it’s fair game. • The answer is no no NO!!!! • Unless it’s Marvel since Universal (unfortunately) still has an area with these heroes and foes, then I’ll have to say no! • Negative, neither is it okay to ask for merchandise from another company. • If you’re over the age of 12 I think it’s an issue. • Got nothing but sarcastic comments from Disney staff when I wore a Universal T at MK. They were like bitter divorce parents having a dig at their other half. • I got [heck] from Winnie the Pooh for wearing a SpongeBob backpack. • Many years ago we were at Nickelodeon Studios in Universal. There was a child wearing a Mickey Mouse shirt. The host called out to the kid with the rat on his shirt. • You don’t go to root for your team with the competitions colors and shirts. You won’t get the full joy of immersion and camaraderie. Best to dress as Minnie or Mickey or wear Disney shirt in order to get the most out of Magic Kingdom…..same for Universal, wear their shirt. • It’s not ok for any adult to wear a Disney shirt, full stop. 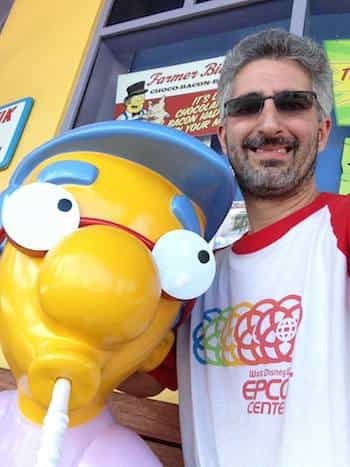 Attractions Magazine Reporter Seth Kubersky wearing an Epcot shirt while posing with Millhouse in The Simpsons area of Universal Studios Florida. While wearing mouse ears to Universal isn’t as hazardous to your health as (for example) sporting a Yankees cap in Fenway Park, several readers who responded in the negative reported having uncomfortable experiences with theme park employees as a result of wearing clothes from the “other side.” On a personal note, I’ve frequently worn my Diagon Alley hat to Disneyland, or my vintage Epcot shirts to Islands of Adventure; in every instance, it’s only resulted in positive conversations with employees and other guests, who are usually eager to learn about other parks. However, if you are the type of person that prefers to blend in with the crowd and avoid interactions with strangers, wearing a shirt that makes you stand out may not be in your best interests. • Where’s the “Who Cares?” emoji when you need it? • Why would you care what someone else is wearing? • What difference does it make? You’ve spent the money to be in the parks…and probably spend a fair bit on food and drinks and souvenirs. • I didn’t even think about what park I was in to what I’d wear that day, I was too busy being excited just being there. • Advice from a Floridian: Just dress so you’re comfortable in this ridiculous heat. I guess there is the Mickey Mouse hat that you see bobbing in the water on the Jurassic Park ride, :). I once wore a SeaWorld shirt to Animal Kingdom and some of the employees asked if I had just been to SW earlier that day, and one told me that she used to work there. None of them made any negative comments. But really, who cares! Is it okay to sport a white “Santa Claus” beard during the summer? Everywhere I go in the parks, the employees and ALL the park performers announce, “Look, it’s Santa!” And they all think they’re SO clever to think of it, just like they think it’s so funny to point out those t-shirts from the other park. Just another theme park cliche, I’m afraid. Boo to the person who said no adults should wear Disney shirts. That’s ridiculous! That person should not go to Disney then ;-). I know someone that managed to convince a caricature artist at Universal to draw him as Jack Skellington. She refused to do it at first, but relented. It looks pretty awesome too.